My first meeting and early conversations with de Klerk took place in 1999 –10 years after the fall of the Berlin Wall, the Velvet Revolution in Czechoslovakia and his own election as president of South Africa. De Klerk was visiting Prague that October as a participant in President Václav Havel’s initiative “Forum 2000,” and the Prague Society for International Cooperation nvited him to dinner as our first Public Policy Speaker. The intensity of the dialogue which followed led to de Klerk being invited to become honorary chair of the Prague Society. His words, “How do we live together?” became the motto for the society’s future program, most especially the 2001 conference of former foreign ministers which he chaired, and which marked the 10th anniversary of the fall of the Soviet Union. The October supper was the first of an irregular schedule of encounters marking a year relationship, even friendship, between the two of us. Eventually I asked him what had led him to call for a non-racist South Africa upon becoming president, why he lifted the ban on the African national Congress and released future President Nelson Mandela, and how this fitted with other positions he had held in the South African government. I recognized a deep and moving passion in de Klerk; a strong belief in ethics and humanity, in spirituality. It simply did not fit his paradigm of humanity and his belief in equality to continue an inhuman system that he now was leading and able to change. He had, even before becoming president, begun challenging the Apartheid paradigms within the National Party as leader of the Transvaal, with little success. However, he began the shift that would lead to his decisions as president. I remember an evening at his farm in Paarl, when I decided to broach his divorce from his first wife Marike (her terrible murder a few years ago shocked all those who knew and cared about the family). It was not an easy topic for him, but it became clear that one of the reasons for the separation is that she could not move forward in the way that he wanted to. Like many Afrikaaners, she could not imagine a South Africa under black rule. I sat in quiet, in complete admiration, that a man would ultimately give up the woman he had loved, created a family with, for a higher ideal. We spoke of Nelson Mandela, of his respect for him. Later in Cape Town, with Dave Steward, his confidante and executive director, we discussed de Klerk’s vision of a Senior Leadership Council — now constituted as the Global Leadership Foundation — that could send former statesmen to difficult areas around the world as mediators. 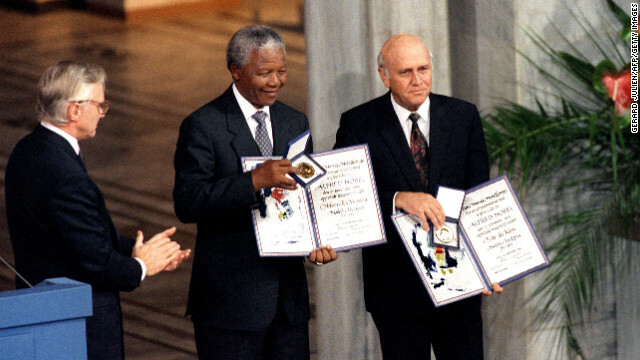 In 1993, six years before I met de Klerk, I had watched the Nobel Prize ceremony in Oslo on television and was offended by the coldness and stiffness being offered him. The adulation shown to Nelson Mandela, though most deserved, should have belonged to both of them. The Nobel Committee’s duplicity disturbed me even then, but that turned to disgust a year later with the awarding of the Nobel Peace Prize to Palestinian leader Yasser Arafat, who did not deserve to stand alongside Yitzhak Rabin and Shimon Peres. I am reminded of a quote my father would tell me while I was growing up — about being a non-conformist, and for that “the world will whip you with its displeasure.” Without a President de Klerk there would have been no President Mandela, and, it goes without saying no Nobel Peace Prize for either of them. But such thinking goes against the current world view, and maybe this is why de Klerk is not getting the respect he deserves. But I know one thing for sure, that to invoke the end of Apartheid without mentioning de Klerk is like talking of the end of Communism without mentioning Mikhail Gorbachev.